If you are like me and every other American in the country, you think big. One philosophy that has been instilled in us is that we can never have too much of something. But there’s a rule of thumb that we all need to think about whenever we get the urge to save everything: if you haven’t used it in a long time, you don’t need it. All of my clothes are hanging in the same direction. After I wear a piece of clothing I am going to hang it in the opposite direction. After two weeks, any piece of clothing that is still hanging the opposite way I will look at. If I haven’t worn it because of the weather, it stays, but if I haven’t worn it during those two weeks and cannot remember when I wore it last, it is going in the sale pile. That is one way to help slim down your wardrobe and put money in your wallet for a new one. The guideline above can be used for all the things in your home. In addition, if you don’t feel like selling these items, which can be a bit arduous, don’t feel bad re-gifting these items. You may simply want to give these things that you bought for yourself to someone else as a gift, that way you don’t get scolded or embarrassed if you give back a gift to a person. Simplify your life, it will help you feel emotionally and financially secure. 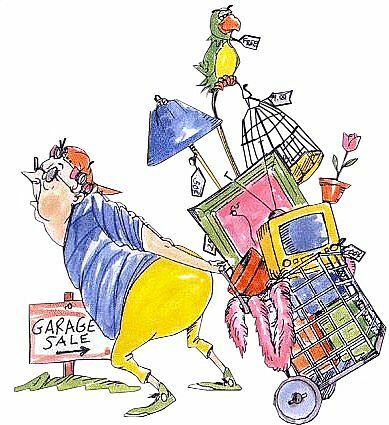 Garage sales are the obvious way to go about making money on items, but if you’re going to do that, you have to make sure you allot a little money for advertisement. Post signs up around the neighborhood and put an ad in the classifieds for your local paper. If you live in a neighborhood with awkward streets that will make it hard for people to find your house, be sure that you put signs that will guide people along the way. You will probably have to get a permit from the city to hold the sale, so be sure that you go do that ahead of time so your sale doesn’t get shut down. If you have neighbors in the area that you like, try having a combined sale. You’ll get a whole lot of people to come if you advertise for a multi-family sale, and you can all work together to knockout set up time really quickly. Just put a different colored sticker on each family’s items so you can split the profits accordingly. Record the value of each sticker into a journal and then tally up the results at the close of the sale. If you find yourself with a lot of extra stuff at the end of your sale, try having a giant clearance frenzy. In my garage sale, I told everyone that they could have whatever they could fit into a Wal-Mart sack for $5, and people went nuts! I had a clean driveway in a half hour, no lie. I was going to give the extra items away anyways, so that way I got to make an extra $60 or so for my leftovers. No matter what you do though, getting rid of stuff you don’t need can be a great way to make money and clean up the house a little bit. A simplified life can lead to a maximized budget if you approach it the right way. What are some ways you make side money off of things you don’t need anymore?